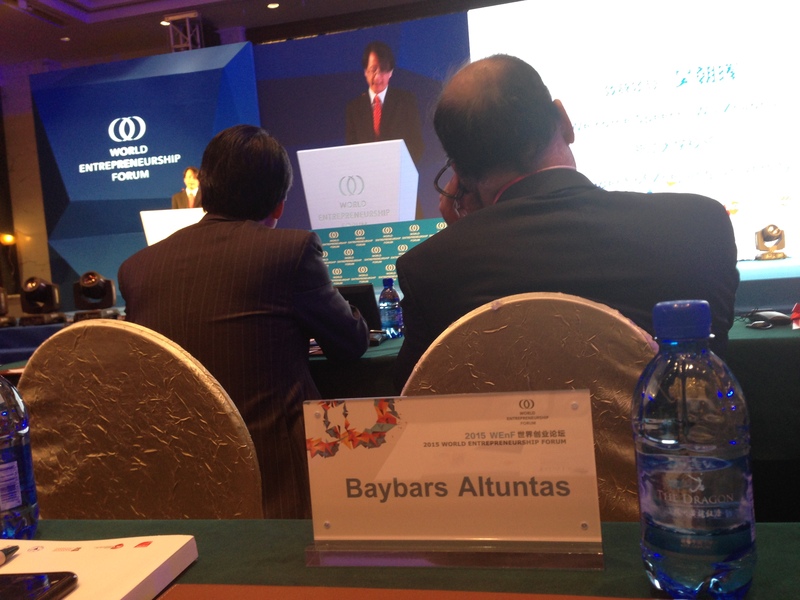 On the 20th and 21st of October, I was in Hangzhou, China to chair the Europe–Asia Business Angels Forum, a sub-forum of the World Entrepreneurship Forum, and to judge the start-ups of the Lions’ Den. 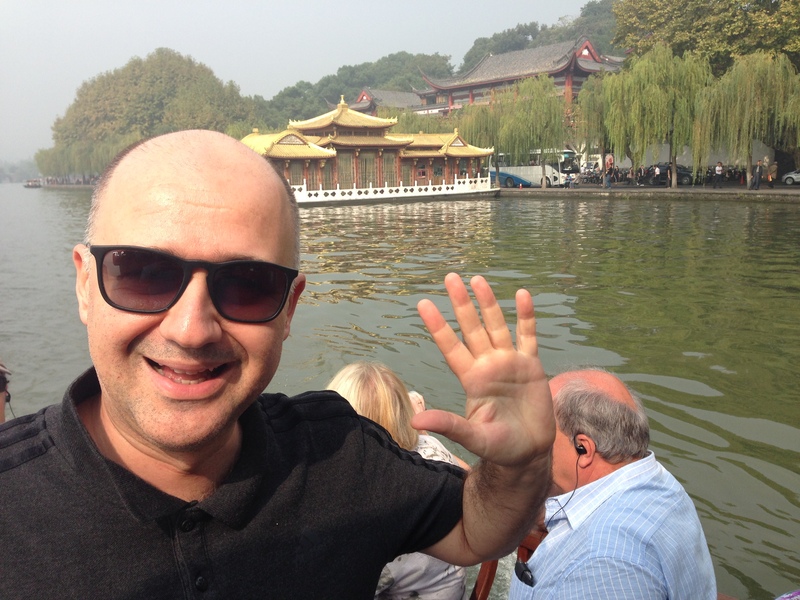 Hangzhou Hi-Tech Industrial Development Zone positions itself as the ‘Silicon Valley’ of China. The Alibaba Group, the world’s largest online B2B portal and China’s largest website in terms of market value, is headquartered in the zone. With a strong leaning towards innovation and new technology, the Zhejiang province is considered the centre of China’s entrepreneurship. The Internet-based e-commerce giant Alibaba, along with Wahaha, China’s leader in the beverage sector, and Geely, the automotive manufacturing company that bought out Volvo in 2010, all have their roots in the beautiful capital of Hangzhou, located just 200 km west of Shanghai. 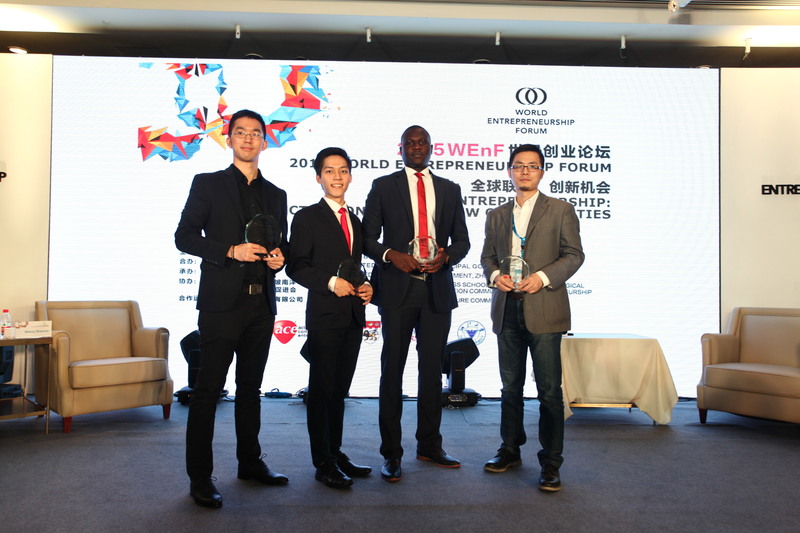 With over 500 participants from more than 70 countries, the WENF (World Entrepreneurship Forum) is one of the world’s most important platforms, connecting entrepreneurs, angel investors, academicians and policymakers from all over the world. 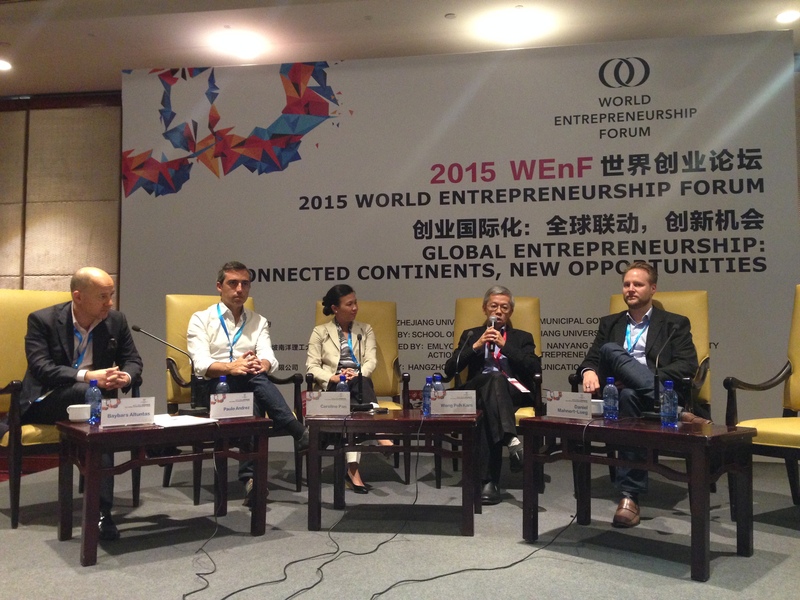 The WENF held its 8th edition this year in China under the main theme of Global Entrepreneurship: Connected Continents, New Opportunities! On the afternoon of the first day, I moderated a session entitled Access to Finance from Startup to Exit, aiming to introduce new financing instruments for start-ups and high-growth businesses in Europe, Asia, and China in particular. 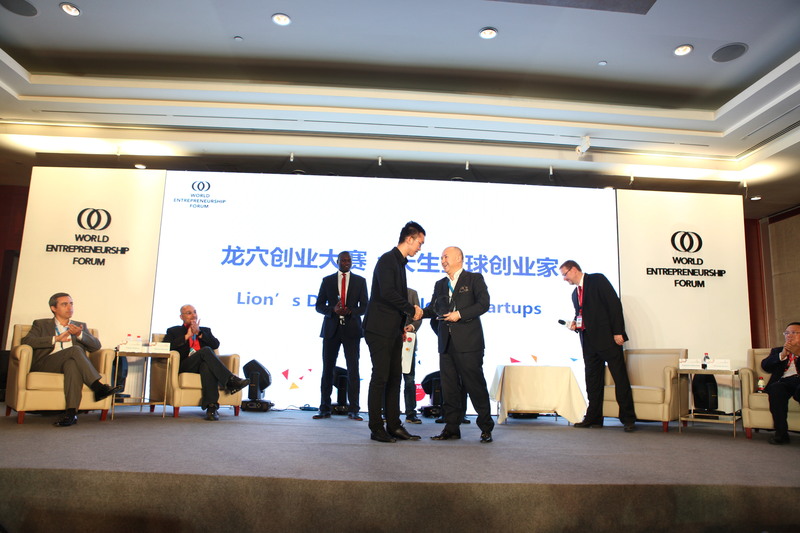 The next morning I was on the stage to judge the finalists of the Lions’ Den, a newly-instituted event at the World Entrepreneurship Forum with 4 experienced Lion investors from 4 different countries to assess the innovative business plans and ideas of 4 talented start-ups from 4 countries. It is a great pleasure for me to have been the idea owner of the Lions’ Den and to be able to lend my know-how and experience, along with other distinguished lions on the jury. 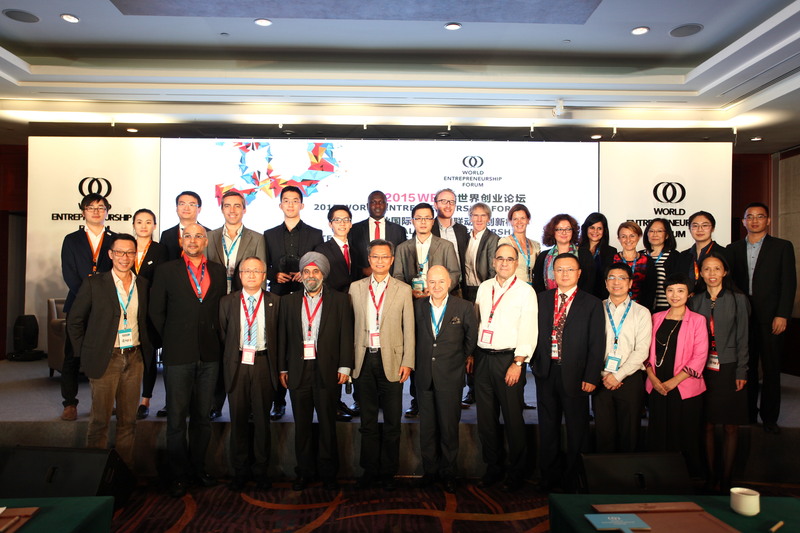 A big ‘thanks’ to Mark Greeven, the chair of the World Entrepreneurship Forum’s 2015 edition, for this wonderful event in China. China is a member of the WTO and is the world’s largest trading power, with a total international trade value of US$3.87 trillion in 2012. Its foreign exchange reserves reached US$2.85 trillion by the end of 2010, an increase of 18.7% over the previous year, making its reserves by far the world’s largest. 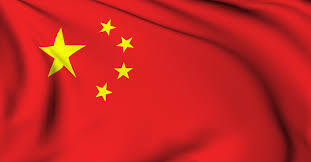 In 2012, China was the world’s largest recipient of inward foreign direct investment (FDI), attracting $253 billion. China also invests abroad, with a total outward FDI of $62.4 billion in 2012, and a number of major takeovers of foreign firms by Chinese companies. In 2009, China owned an estimated $1.6 trillion of US securities, and was also the largest foreign holder of US public debt, owning over $1.16 trillion in US Treasury bonds. China’s undervalued exchange rate has caused friction with other major economies, and it has also been widely criticized for manufacturing large quantities of counterfeit goods. According to consulting firm McKinsey, the total outstanding debt in China increased from $7.4 trillion in 2007 to $28.2 trillion in 2014, which reflects 228% of China’s GDP, a percentage higher than that of some G20 nations. 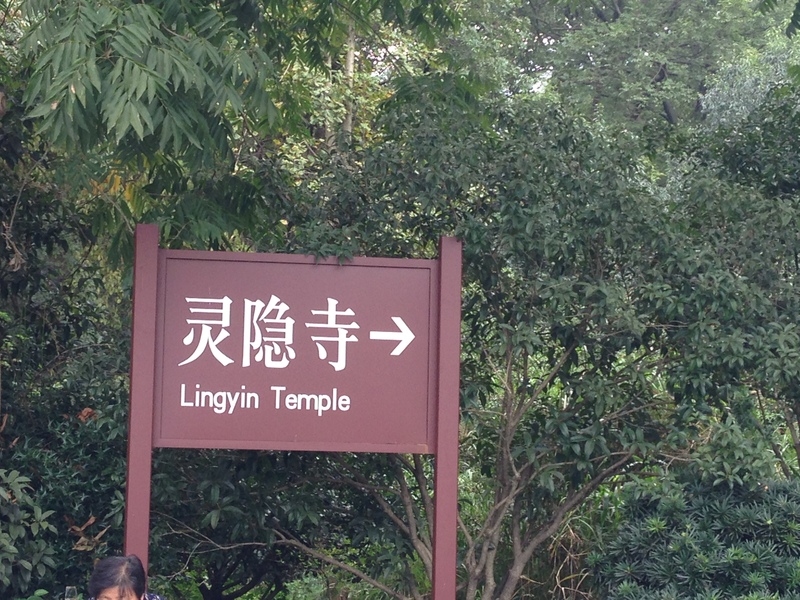 Hangzhou is listed as one of the Seven Ancient Capitals of China. It was first the capital of the Wuyue Kingdom from 907 to 978 during the Five Dynasties and Ten Kingdoms Period. 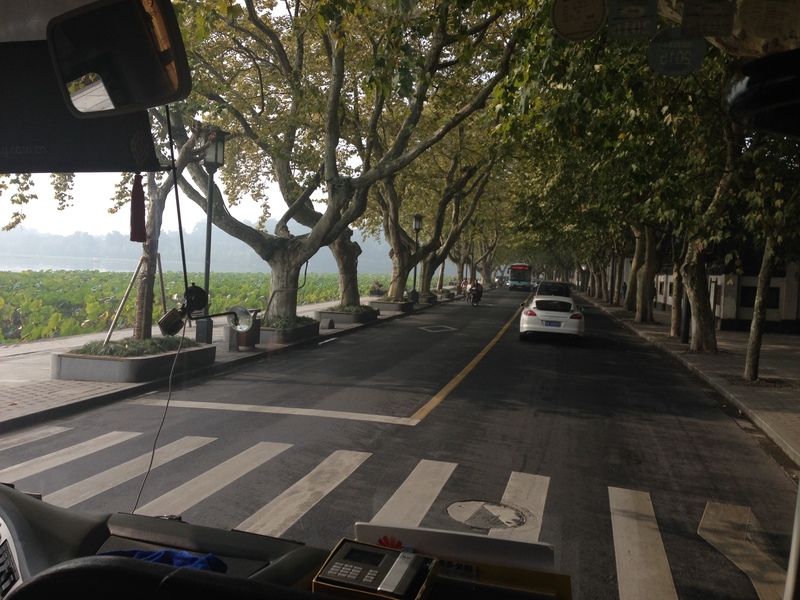 Hangzhou’s economy has rapidly developed since its opening up in 1992. It is an industrial city with many diverse sectors such as light industry, agriculture, and textiles. It is considered an important manufacturing base and a logistics hub for coastal China. The Hangzhou Economic & Technological Development Zone was established and approved as a national development zone by the State Council in 1993. It covers an area of 104.7 km2 (40.4 sq. mi.). Encouraged industries include electronic information, biological medicine, machinery and household appliances manufacturing, and food processing. The Hangzhou Export Processing Zone was established on April 27, 2000 upon approval of the State Council. It was one of the first zones and the only one in Zhejiang Province to be approved by the government. Its total planned area is 2.92 km2. 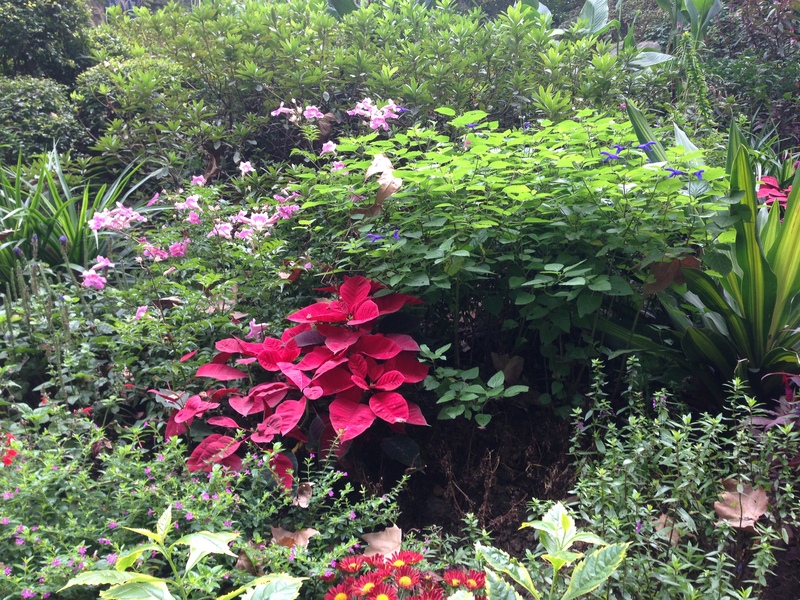 It is located close to the Hangzhou Xiaoshan International Airport and the Hangzhou Port. 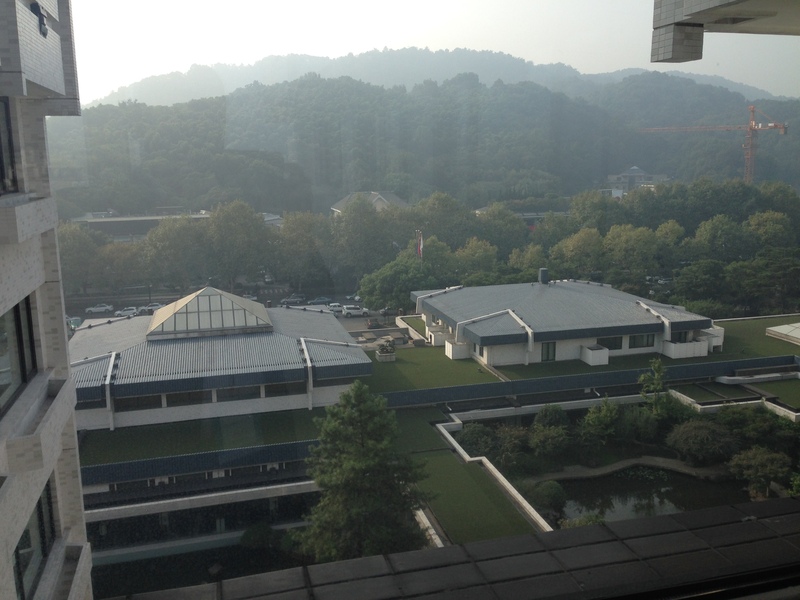 The Hangzhou Hi-Tech Industrial Development Zone (HHTZ) was set up with approval from the State Council in March 1991. It is composed of three areas, with the main regions being the Zhijiang Sci-Tech Industrial Park and Xiasha Sci-Tech Industrial Park. The HHTZ has become one of the most influential hi-tech innovation and hi-tech industry bases in the Zhejiang Province. As of 2013, the HHTZ has hosted more than 1,100 software developers and BPO enterprises. Major companies such as Motorola, Nokia and Siemens have established R&D centres in the zone. In 2011, the GDP of the zone rose by 13.1 percent, amounting to RMB 41.63 billion. 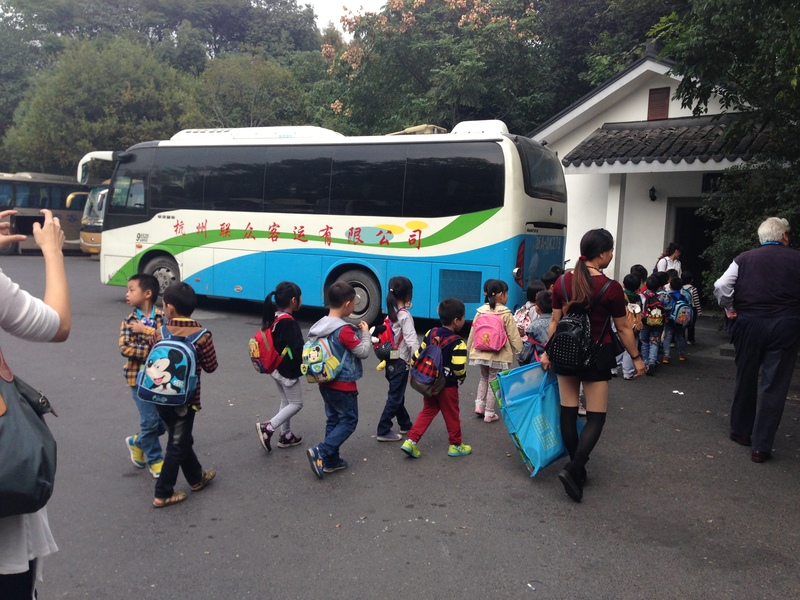 This accounted for 5.9 percent of Hangzhou’s total GDP. 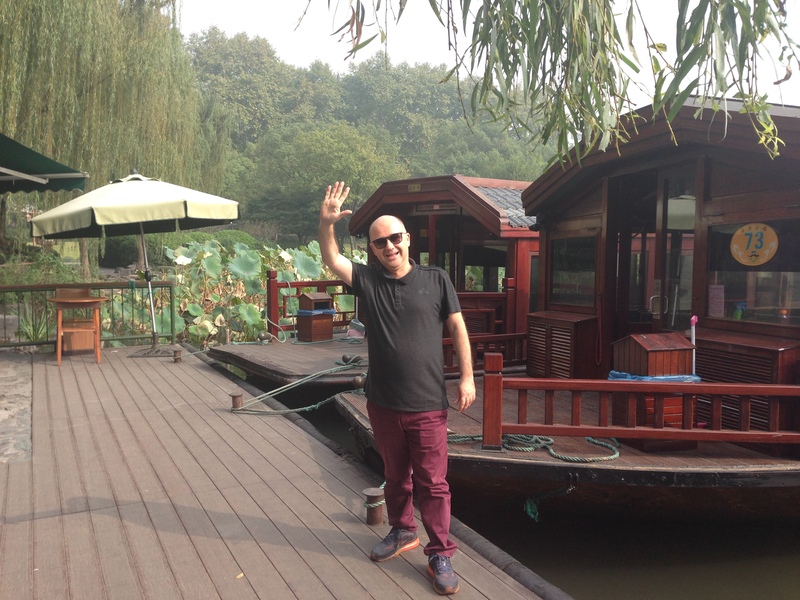 The HHTZ positions itself as the Silicon Valley of China. The Alibaba Group, the world’s largest online B2B portal and China’s largest website in terms of market value, is headquartered in the zone. With the current main disruptive changes the world is facing, entrepreneurship, creating both wealth and social justice, is key to shaping the world of 2050. Through recommendations and actions, the Forum aims at creating a strong impact on entrepreneurs and stakeholders to drive the change towards a more entrepreneurial world. Over 750 entrepreneurs from 80 countries have already joined their peers to rethink, act on and transform their environment with the Forum. gathers a community of entrepreneurs from five continents: It is a powerful global network of leaders selected for their achievements and commitment to society. fosters a new humanism: The WENF promotes the development of entrepreneurship creating wealth and social justice. This dual approach, economic and social, is one of the distinguishing features of the Forum. is an integrated think tank and a do tank: The WENF shares the latest trends and issues about global entrepreneurship developing ideas and recommendations to facilitate entrepreneurial initiatives on a local or global scale. 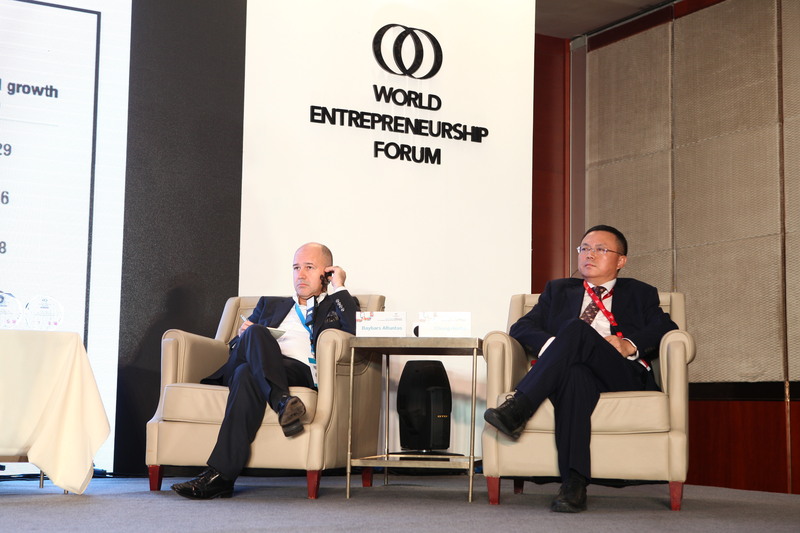 This year’s annual meeting of the World Entrepreneurship Forum was held in China; the venue is rotated every year among founding-member countries. 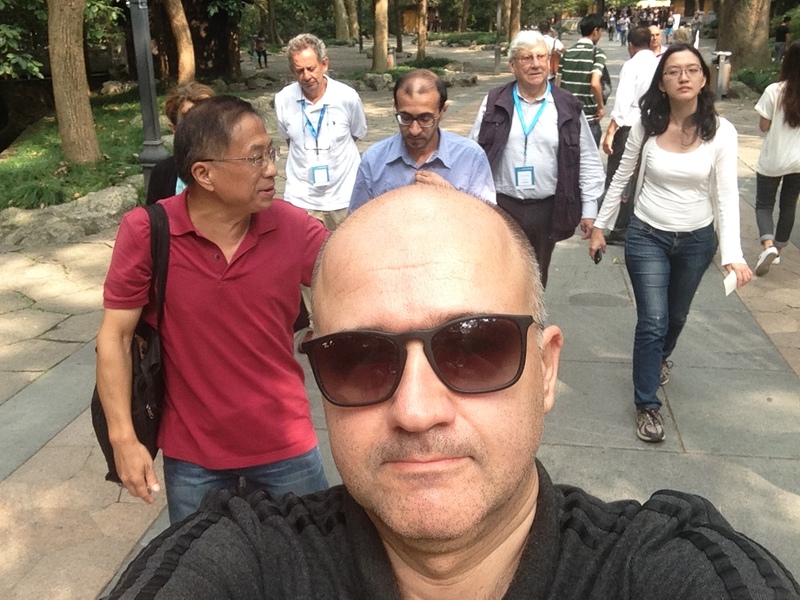 There are 3 founding members of the forum: Em-Lyon Business School of France, Nanyang University of Singapore, and Zhejiang University of China. Last year it was in France, and the previous year in Singapore. The Forum includes a gala dinner for the year’s award winners. 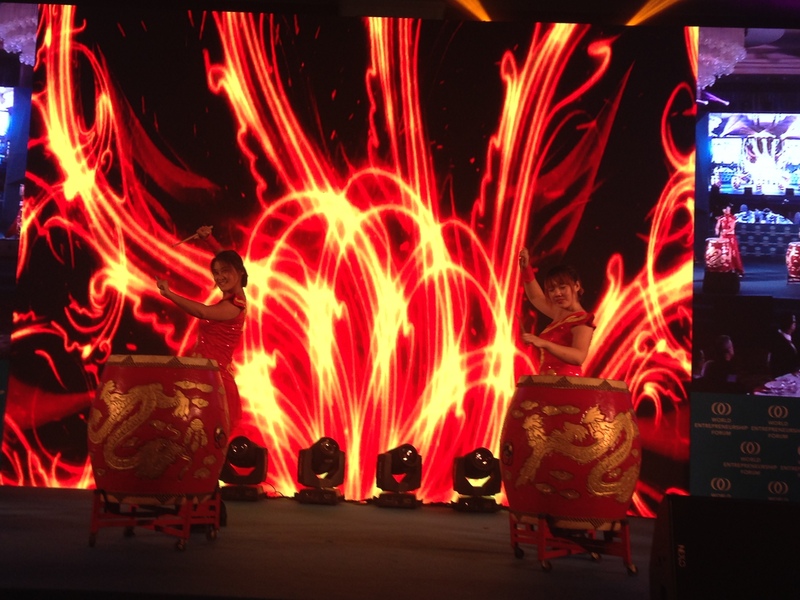 This year’s gala dinner was held at the Dragon Hotel, also the venue for the forum meetings. In 2014, the World Entrepreneurship Forum broke new ground with the launch of the Crowds’ Den experience. 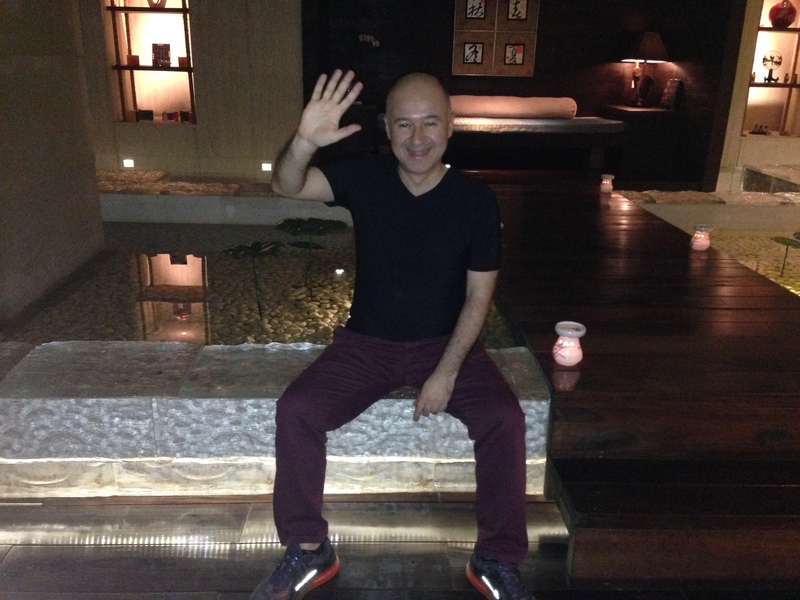 I was the originator of the idea, which aimed to create a unique experience for Forum participants that would facilitate the emergence of businesses and projects that support the WENF’s values, mission and vision. The Crowds’ Den combined modern crowdsourcing activities with the excitement of a ‘Dragons’ Den’ pitch in front of experts. A small number of selected early-stage projects were offered the chance to present to a panel of experts, Forum participants and the entire web in order to gain support, sponsorship, recognition and of course financial assistance. 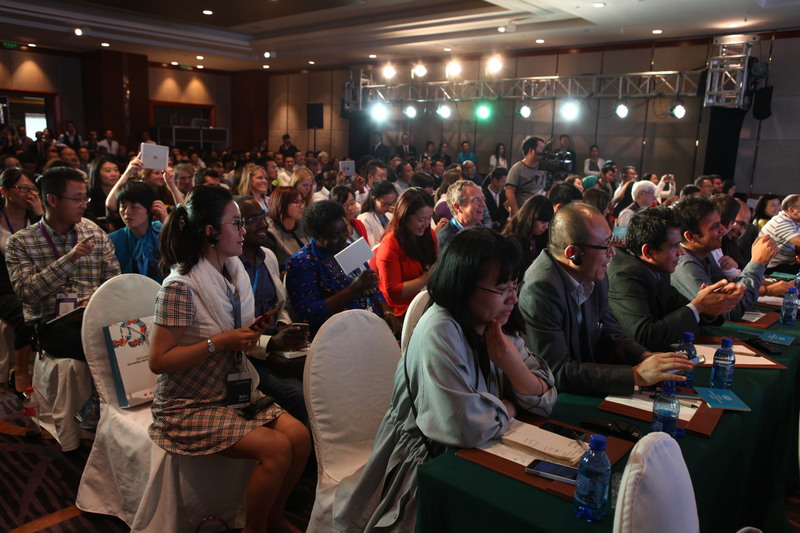 This year, the name was changed to Lions’ Den and the online crowdfunding part of the competition was replaced by a show of hands from the audience, without putting any money into the projects. Projects were sourced during the summer of 2015. The goal was to identify 4 projects in the early stage. 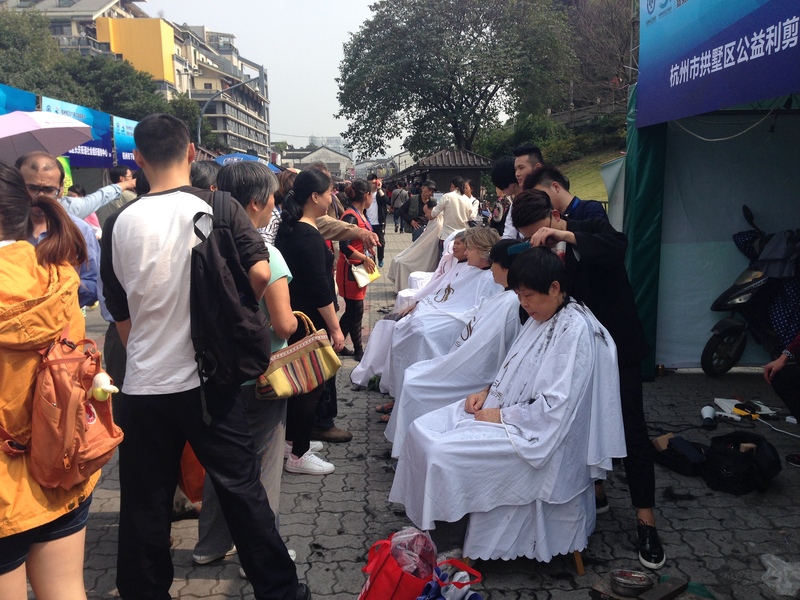 On Day 2 of the Forum, the Lions’ Den took place from 11.00 to 12.30. During this 90-minute period, each of the projects had roughly 15 minutes to pitch their project and to take questions from the Lions (jury) experts (8 min presentation / 7 min Q&A). A panel of 4 experienced Lion investors assessed the innovative business plans. 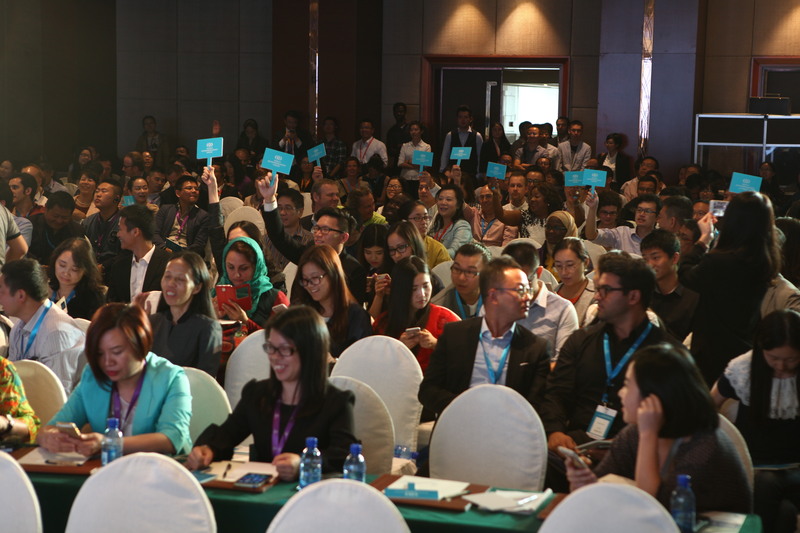 The crowd was invited to vote for the project of their choice and to nudge their favourite start-up in the right direction. It was a great honour for me to present the award to the winner of the competition, Chen Chiu Hao (“Ted”), Co-founder and Product Architect of Evercomm, Singapore. Note: When I receive the video of the session, I will put it here. Because I have to be in Istanbul every Friday through Sunday to film The Weakest Link’s Turkish version, I needed to leave the studio exactly at 8pm to catch my 01.05 flight to Beijing on the 19th of October. 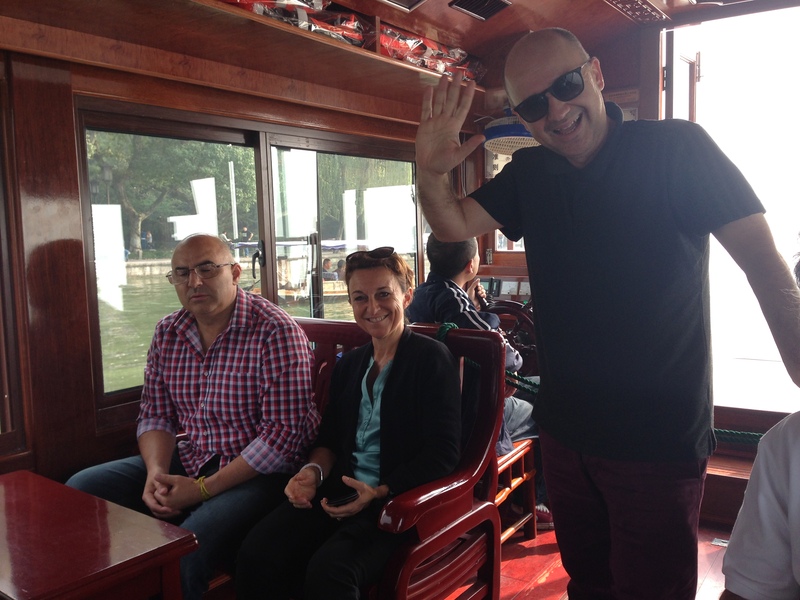 So I had just 5 hours to get to China once the Sunday filming had ended. I ran to my room at the studio to change clothes and drove to the airport to complete all my boarding, passport control procedures. Thanks to the CIP – Business Class services of the Turkish Airlines, I was at the boarding gate of the Beijing flight at exactly 00.30. The flight attendant said: You are the pilot at the Turkish Airlines, aren’t you? I said: No – I’m not a pilot. She: Sorry for disturbing you. I’ve just checked your name and learned you are Baybars Altuntas. Because I watch your show every week, I was sure I knew you but I couldn’t recognise you here in your casual clothes!. 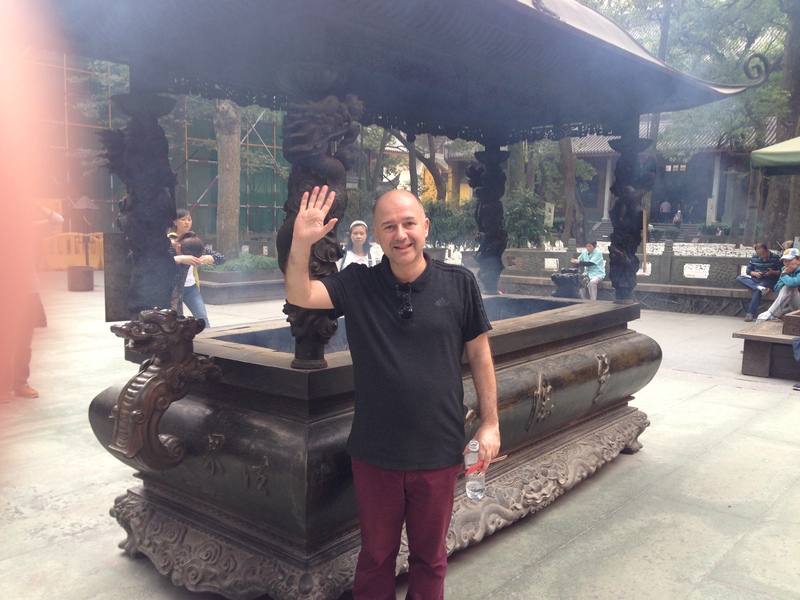 I arrived at the Beijing Airport after an excellent 9.5-hour flight from Istanbul. 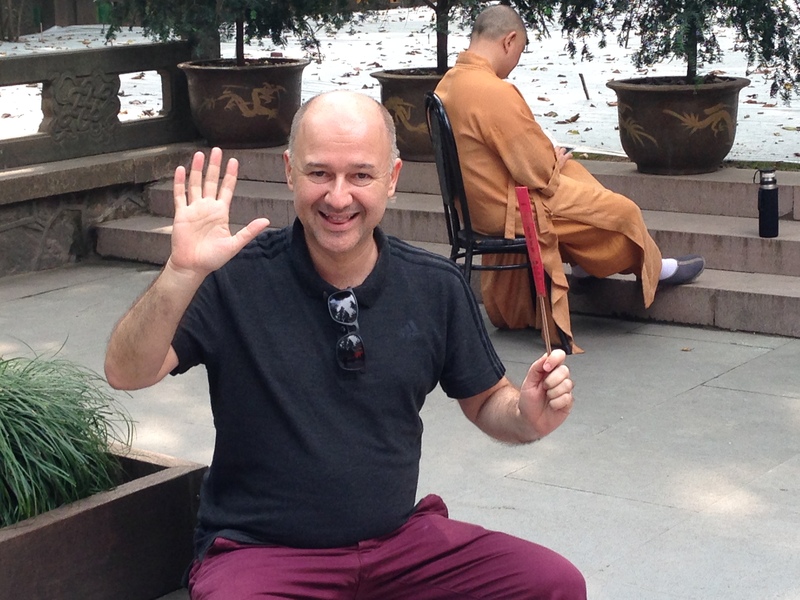 This was my first time in China and I was very surprised by the quality of the airport and the service provided by the staff. 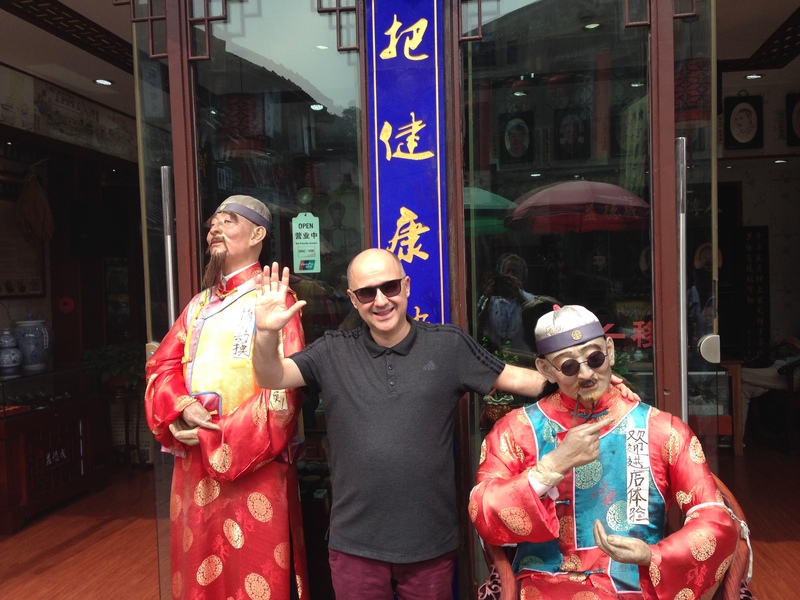 Beijing Airport is a huge airport, so if you are using Beijing as a transit, I advise you is to arrange your connecting flights with a minimum 3 hours connection time. When you see the queue at the passport control, you will understand what I mean. I arrived at the Beijing airport at 3pm and it took an hour to complete the passport control. If it is your first time in China, you are invited to the Further Inspection Room, where you have to explain why you are in China. After spending half an hour in the Further Inspection Room, I took the shuttle-train to the domestic terminal to take the 5.50pm flight to Hangzhou. 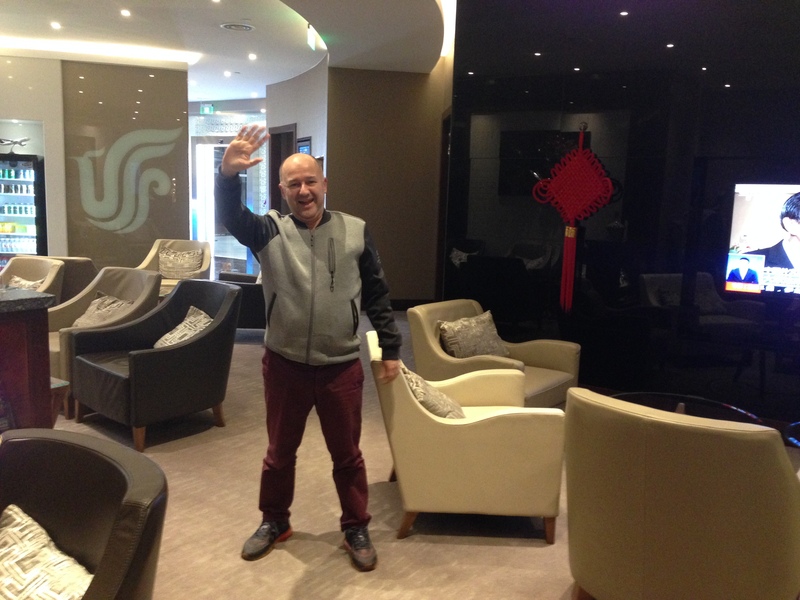 I waited for the flight at the spacious CIP lounge of Air China, which presented delicious Chinese food. Chinese cuisine is my absolute favourite cuisine. It offers excellent taste with healthy cooking techniques. I genuinely enjoyed the traditional Chinese food at the CIP lounge. After a 2-hour flight from Beijing to Hangzhou with Air China, I arrived at the Hangzhou airport at 9.50pm. I was transferred to the Dragon Hotel by a special VIP Audi Service arranged by the World Entrepreneurship Forum It took about 40 minutes to reach the hotel and I was given a room with a delightful mountain view. After filming 8 hours in Istanbul and a flight from Istanbul to Beijing followed by another flight to Hangzhou, I was finally in my room. There was a reception at the lobby but I was so tired that I couldn’t convince myself to go down for the reception. After unpacking, I fell asleep. 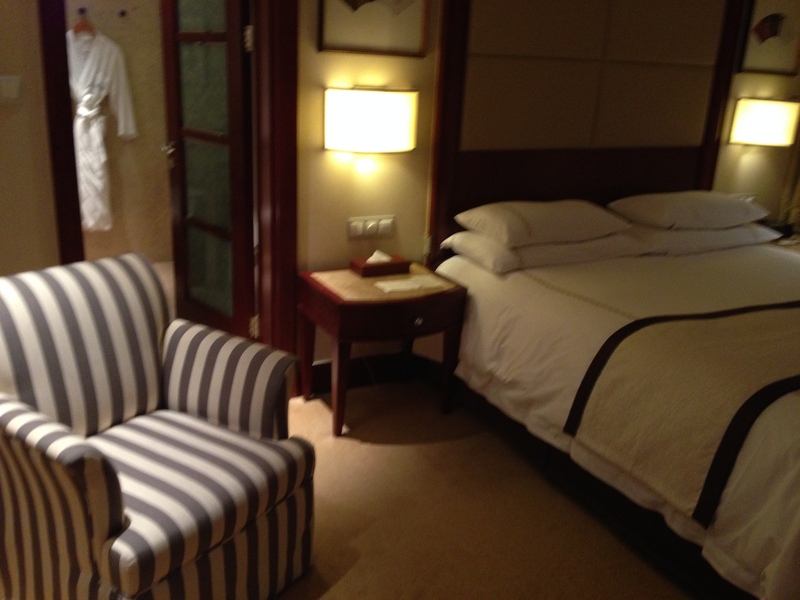 By the way, the Dragon Hotel of Hangzhou is a perfect 5-star hotel, located in the city centre. I found it interesting that the hotel belongs to the government. It was the first time I had seen such a perfect hotel owned by the state. 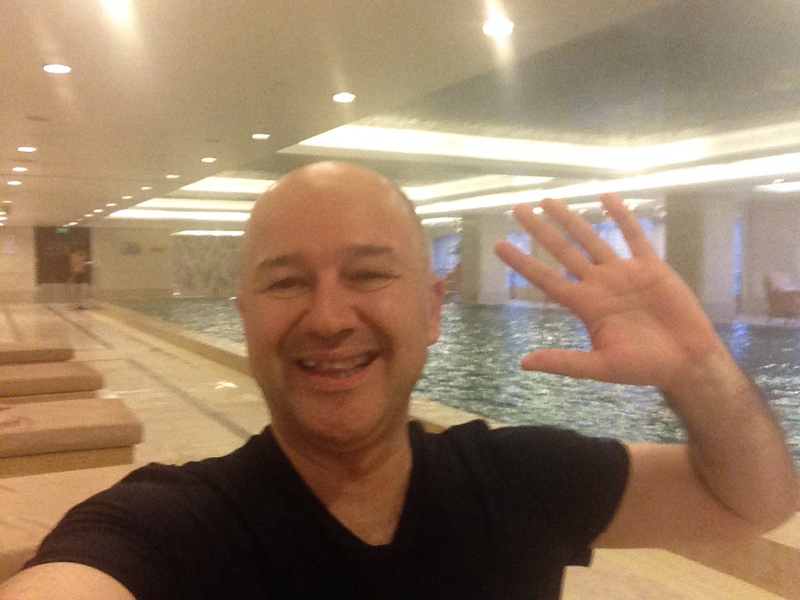 If you prefer a different location, then the Shangri La and Four Seasons are also excellent choices, but the Dragon Hotel is definitely in the top 5 hotels I have stayed in until now. Europe has 275,000 business angels who invested 5.7billion EUR last year in the start-ups of Europe. Asia, on the other hand, is an emerging early-stage investment market including business angels, crowdfunding platforms, incubators, accelerators and technoparks. This forum discussed ways that cross-border investments between Europe and Asia can be increased, ways to facilitate co-investments in start-ups of Europe and Asia, what innovative instruments could ease access to finance for start-ups and SMEs at the very early stage, and ways to foster bench-marking between European and Asian business angels. This forum also provided excellent networking opportunities with the global leaders of the angel investment ecosystem. What are the differences between European and Asian business angel financing approaches to high-growth businesses? What are the opportunities and challenges in cross-border Europe-Asian angel investing and other early-stage investing? Is it a good strategy to convert serial investments of serial angel investors (super angels) to venture capital and / or private equity funds? How can we foster collaboration between SMEs and CBAs to increase the innovation in all stages of every entrepreneurial activity? How can angel investors cooperate with private equity funds to leverage the early-stage investment market in Europe and Asia? The sub-forum on access to finance for global entrepreneurs ended at 4:30pm after the questions of the audience were answered and the take-home messages of each speaker were delivered. 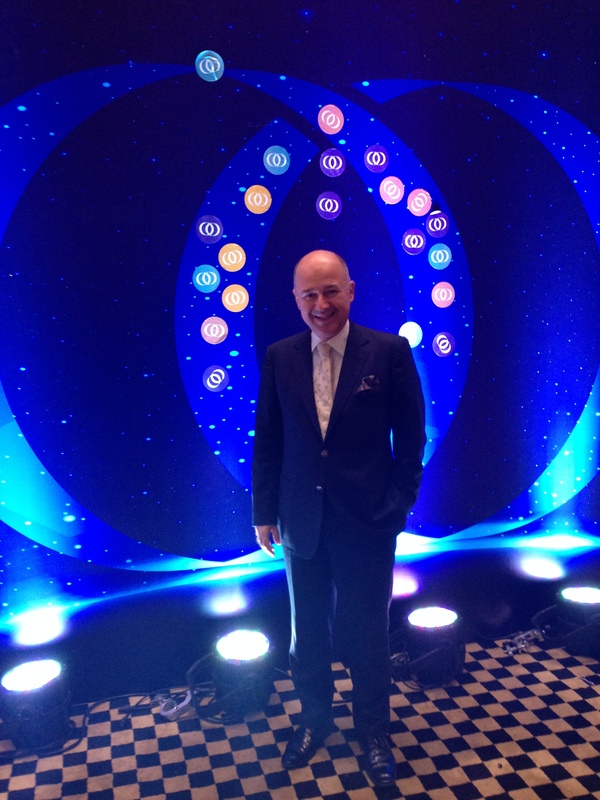 I was in my room to get ready for the Awards & Gala Dinner, which would start at 6.30pm. 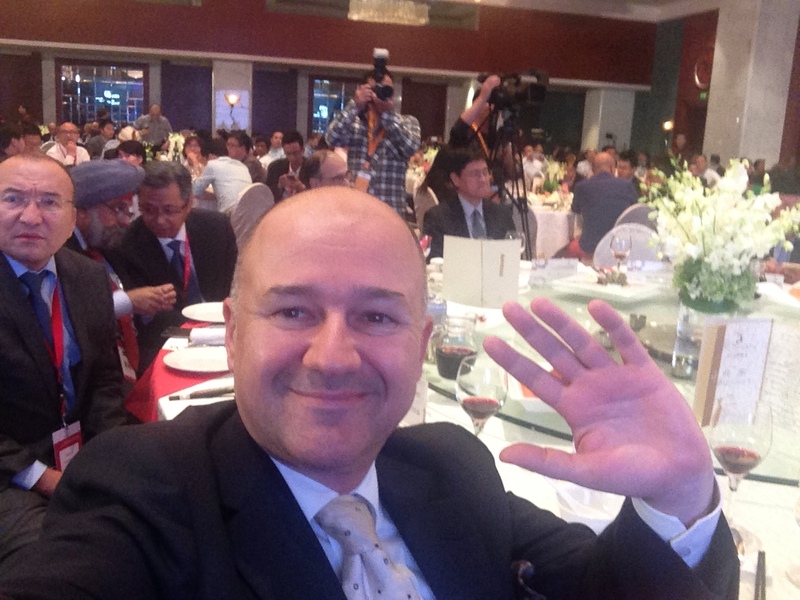 I arrived in the Gala Dinner Hall promptly at 6.30pm and was seated at the main table with other guests. During the dinner I found an opportunity to chat with the 2015 award winners because we were all seated at the same main table. Here is the list of the 2015 award winners. They each gave a speech of about 5 minutes and we watched a short video about the roots of their successes. I would like to congratulate each of them here again and thank them for their kind contributions to making the world a better place for future generations. Around 9pm, the award ceremony ended and I left the dinner because I was a little bit tired; I wanted to rest in my room. I then went to the main conference room for the Lions’ Den. For more about the Lions’ Den, please refer to the Lions’ Den section above. After the Lions’ Den, we all went to the Junior WENF session, where I was on the jury to identify the best JWENF Project. The finalists were from Israel, India and Chile. The winner came from Chile. I had voted for India because I enjoyed the India team’s presentation very much. Here you can find te excellent presentation of the Indian Team. After this session, I visited the Spa Village of the hotel, which was one of the best hotel spa centres I have visited recently. I took a nice 105-minute massage from 4,30 to 6.00pm at a cost of around 250 USD. It was perfect until I learnt from Stephanie that it was only 20 EUR at the massage saloons outside the hotel. 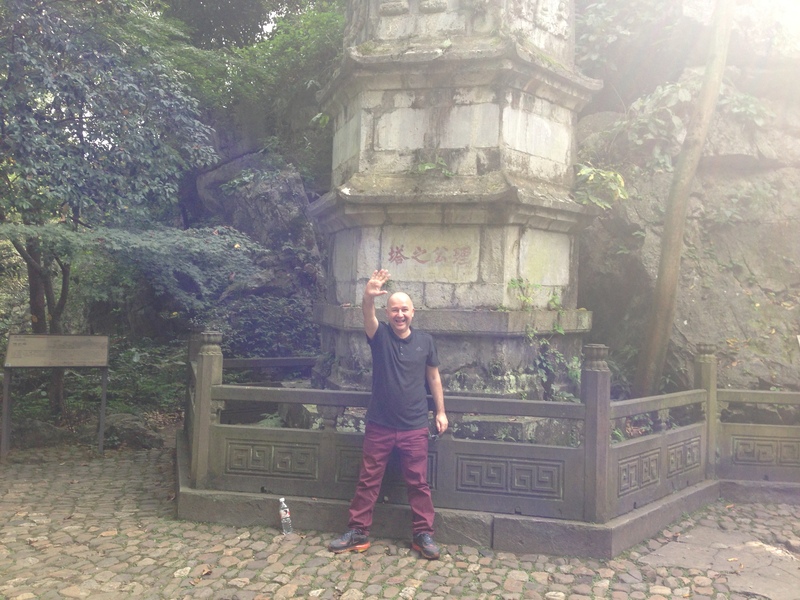 Nevertheless, it was an excellent experience in China for me. By 7.30pm, I went up to the 3rd floor of the conference venue because I had been informed that the community dinner would start at 7pm there. 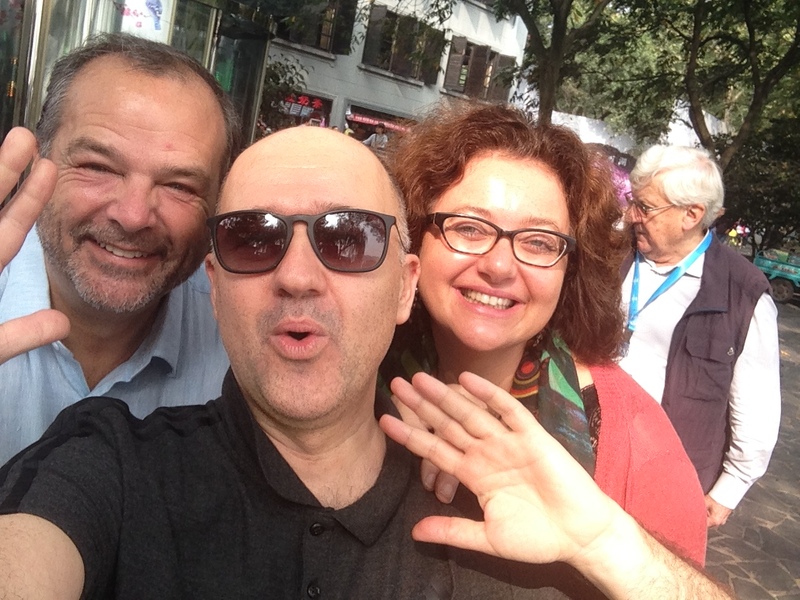 Unfortunately, the clerk at the registration desk had mis-informed me: The community dinner was outside the hotel, and around 90 WENF members had left the hotel around 6.45pm for the dinner. It was rather far from the hotel, which made it impossible for me to attend. I returned to my room and wrote my article for the weekly Money magazine in Turkey, where I’ve been writing weekly articles for the last 3 years. 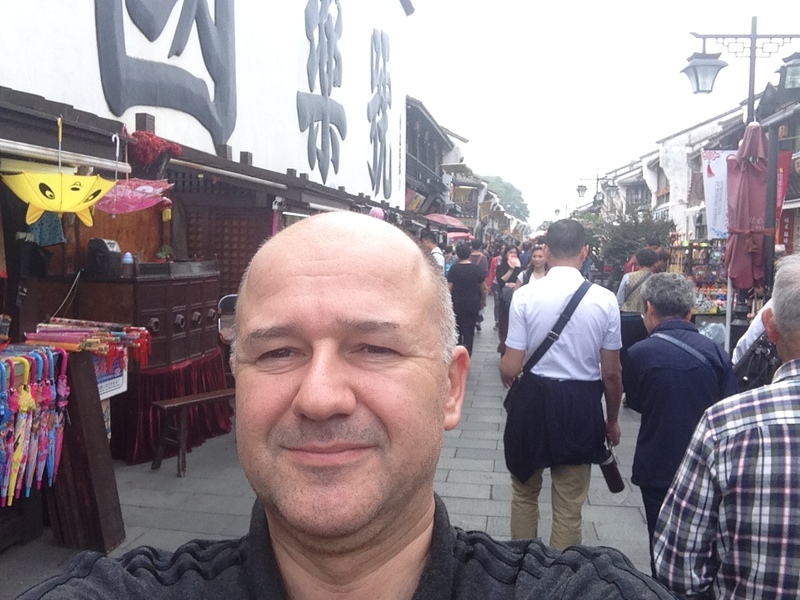 Here you can enjoy my article in Turkish about WENF’s 8th edition in China. I arranged with the hotel reception for a late check-out because my flight wasn’t until 7.35pm. They extended my stay in the room until 3pm, which was perfect for me because I was planning to return to the hotel at 2pm after a sightseeing tour. I chose Option 2, as did 10 of my friends. The guide collected us from the lobby at 9am and we started our tour at 9.30. First of all, I have to let you know that this was one of the most enjoyable half-day sightseeing tours I have ever taken, so I was very happy to have chosen Option 2. 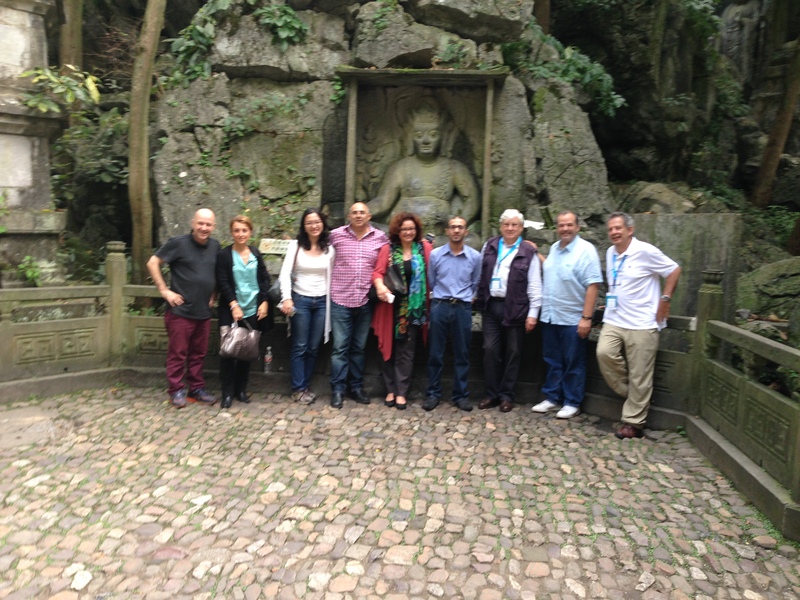 The tour had 3 parts and included an excellent lunch at a traditional Chinese house. 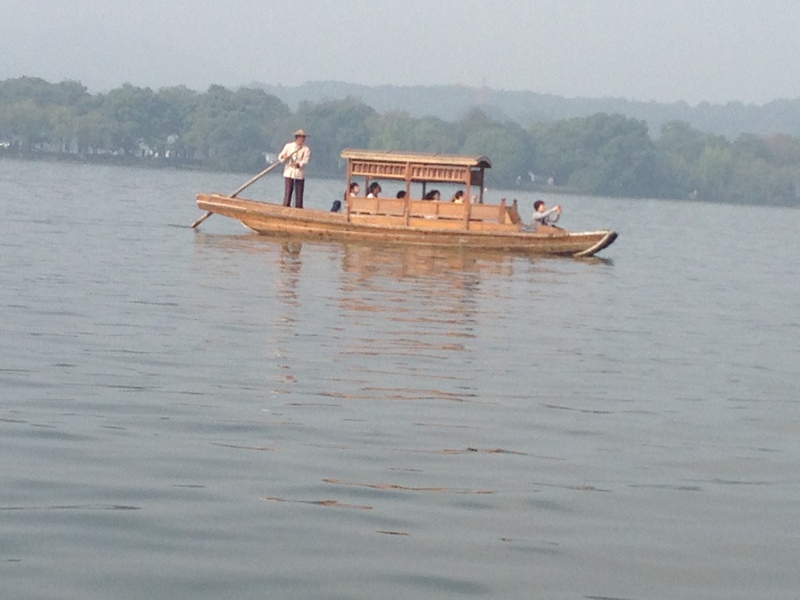 Cruising on the West Lake: West Lake is a freshwater lake in Hangzhou, the capital of Zhejiang province in eastern China. It is divided into five sections by three causeways. 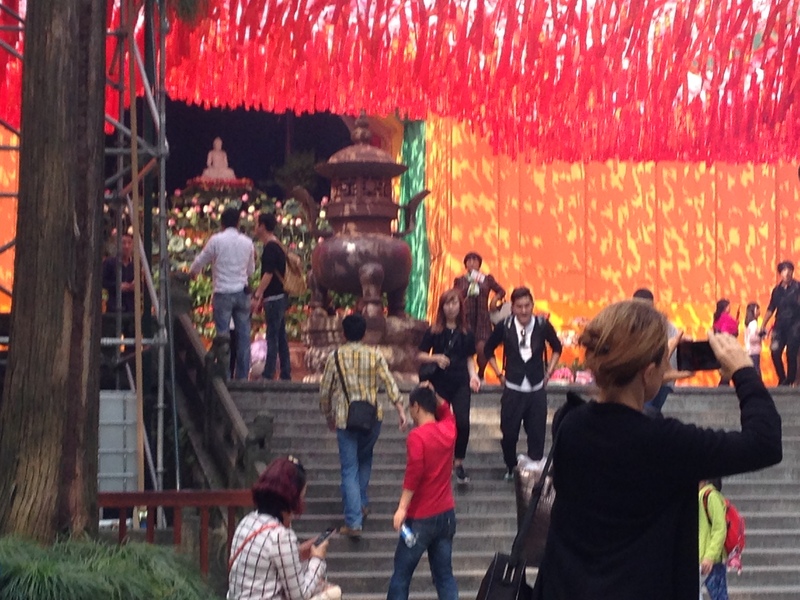 There are numerous temples, pagodas, gardens, and artificial islands on the lake. West Lake has influenced poets and painters throughout Chinese history for its natural beauty and historic relics, and it has also been among the most important sources of inspiration for Chinese garden designers. It was named as a UNESCO World Heritage Site in 2011, described as having influenced garden design in the rest of China as well as Japan and Korea over the centuries and reflecting an idealized fusion between humans and nature. 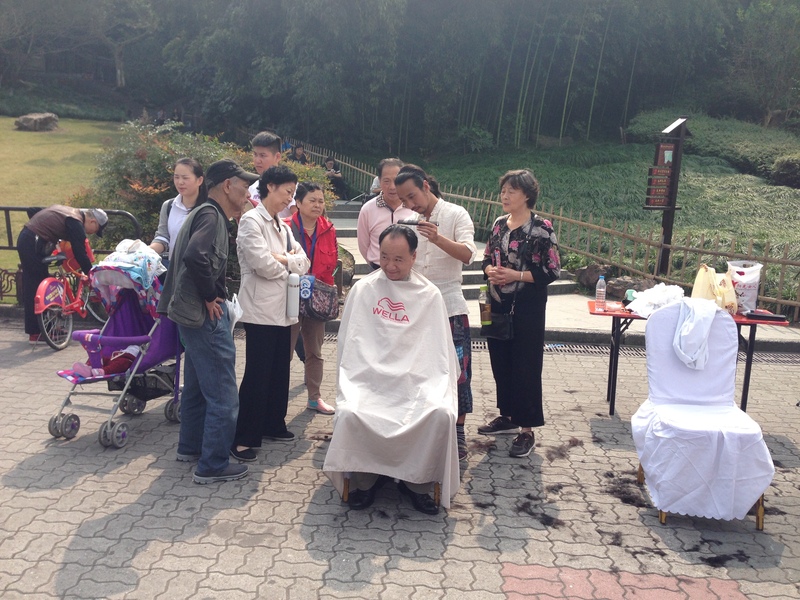 He Fang Street: A historical market street where one can also see the traditional barbers. Bargaining is a must. It was a wonderful tour. I cannot possibly explain it to you — you have to experience it yourself as we did, in such excellent autumn weather. The lunch at the end of the tour was another story . . . exquisite Chinese food with more than 20 different courses. After lunch, we were back at the hotel around 2.30pm and I dashed up to my room with only 20 minutes to vacate the room. I managed to leave the key at the reception at exactly 3pm. Then because the VIP car was available to take me to the airport, I preferred going to the airport a little bit early instead of living the stress of the traffic. There was a nice CIP lounge where I could continue eating Chinese food. I was at the CIP lounge from 4pm until 7pm. The only inconvenience at the CIP lounge was that I wasn’t able to use the WIFI service of the lounge (it was restricted to the mobile operators of China), so I spent all my time in the lounge developing my skills in eating, drinking, reading and writing. 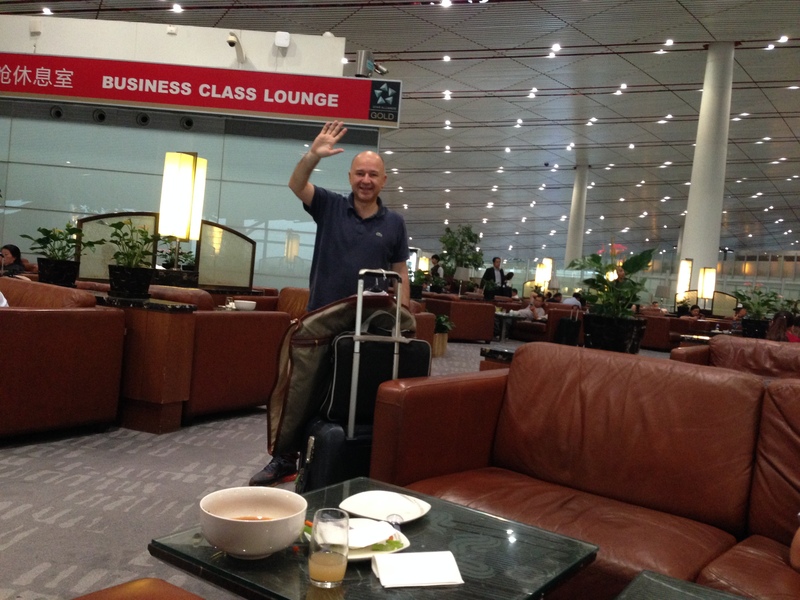 I found myself again at the Beijing airport around 10pm after a 2-hour flight from Hanghzhou. I moved up to the CIP lounge of Air China, which is also used by Turkish Airlines, to wait for my 00.10am flight to Istanbul. Turkish Airlines also left on time and I was in Istanbul at 05:20 Turkey time. Then I managed to catch my domestic flight to Adana (in the south of Turkey) at 6.30am. Because I had planned a short holiday in Cyprus, I had to fly to Adana first, where one of my daughters is studying. The flight from Adana to Nicosia, Cyprus is just 35 minutes. A big round of applause goes to the Executive Chairman of the World Entrepreneurship Forum Professor Tugrul Atamer and his excellent team, and to Professor Mark Greeven, the Chair of the 8th World Entrepreneurship Forum in China. The meaning here lies in the fact that Suzhou was renowned for its beautiful and highly civilized and educated citizens, Hangzhou for its scenery, Guangzhou for its food, and Liuzhou (of Guangxi) for its wooden coffins, which supposedly halted the decay of the body. This phrase has a similar meaning to the English phrases ‘heaven on Earth’ or ‘God’s country’. 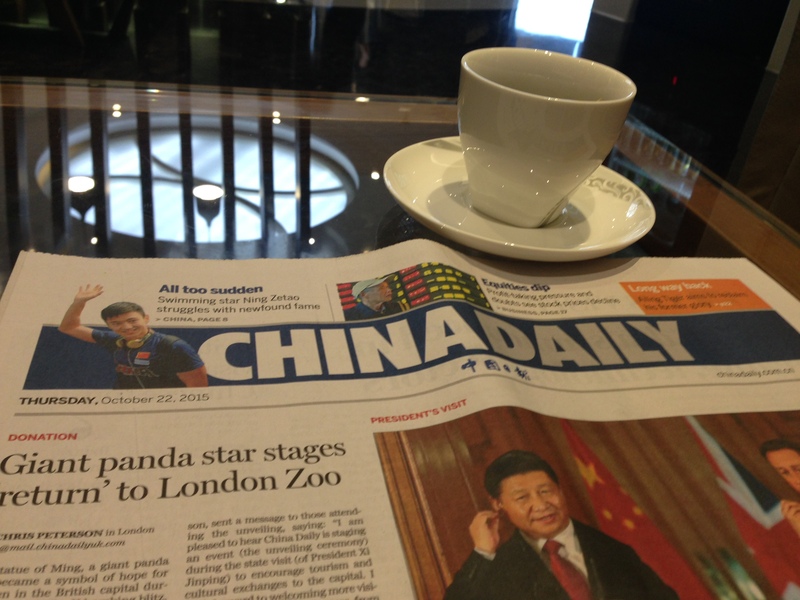 By the way, here you can enjoy the article of Mirela Sula of the UK’s Global Woman Magazine about the 5 men inspired her in China. 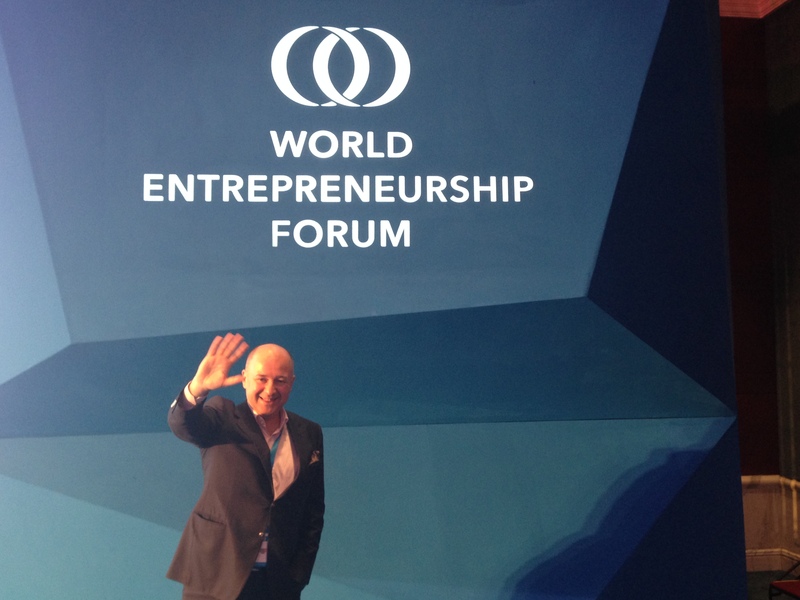 See you at the 9th World Entrepreneurship Forum next year in October!